The entrepreneur is an innovator, a promoter, often a risk-taker, someone with a desire to create and a willingness to take full responsibility for his or her actions. In this lecture, The Rt Hon The Lord Young of Graffham charts the changing role of the entrepreneur over the last two centuries. This is the 1985 Gresham Special Lecture. 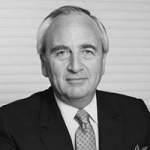 David Young, Lord Young of Graffham, was Secretary of State for Employment betwen 1985 and 1987, and Secretary of State for Trade and Industry between 1987 and 1989.